If you follow TNW on social media sites like Twitter, Google+ or Facebook, you’ll have noticed that rather than use the full, ugly ol’ URL found in the address bar, we use a nice friendly shortened one like tnw.to/c0buZ. If you don’t follow us in these places, what are you waiting for? Do it now! Don’t worry, we’ll wait for you to come back before continuing. Good, now it’s time to check out some of the best and easiest ways of setting up your custom URL shortener so that your links can look as professional as the best of them. Now that all URLs posted to Twitter take up either 22 or 23 characters regardless of their actual length, the main point of a URL shortener is to make the links in your tweets and other social media postings look neater and bestow an air of professionalism upon them. Other benefits to having your own custom short URL are things like consistent branding and increased link trust – no one likes clicking on random links, so knowing it comes from a trusted source goes a long way towards increasing the likelihood that users might engage with it. If you’re looking for help in finding the perfect domain name, look no further than here for some tips. Now, onto the tools to actually manage the automatic shortening of the URLs you share. If you’re searching for ways to shorten your own URLs to something more palatable for sharing across social media then you’ll likely have come across a lot of information about buying your own custom URL and then setting up your own service on that. However, while this is a good way to keep full control over your URL shortening needs,it is a little bit more complicated than some of the other alternatives available nowadays, it’s probably also overkill for a less-frequent user. If you do want to go on the host your own route, then there’s some short instructions about that at the bottom. Usually somewhere near the top of many article recommendations for creating custom shortened URLs is Bitly. You’ll still need that custom URL like tnw.to to shorten it to, but you won’t be burdened with the need to actually make sure the service is always up and running and take care of the hosting side of things. That said, you’ll need to make a few DNS changes to ensure the URL you’ve purchased works. While that’s obviously a bit simpler if you’re looking for a straightforward setup, it also brings the benefit of a full suite of analytics to help you make sense of the best time to post, what your social viewers engage with most and a host of other data to help you hone your content. Surprisingly perhaps, Bitly’s service is free for a single domain, although there is an enterprise edition for multiple domains and more advanced analytics. If you’re looking for something altogether more fully-featured than Bitly, but that can also provide you with that custom URL shortened domain, then Awe.sm could be worth checking out. 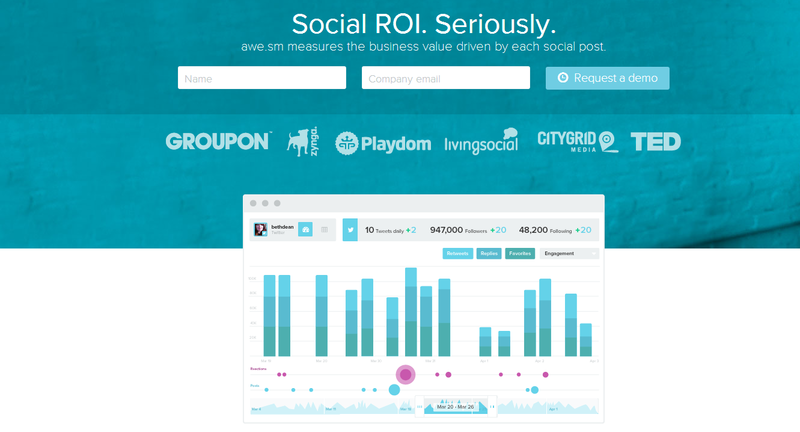 Rather than simply providing metrics around your content, Awe.sm also allows for tracking of how social activity relates to a company’s KPIs. It also claims to be able to define multiple outcomes to track for each post, and attribute each conversion to the specific social post that caused it. Smart. 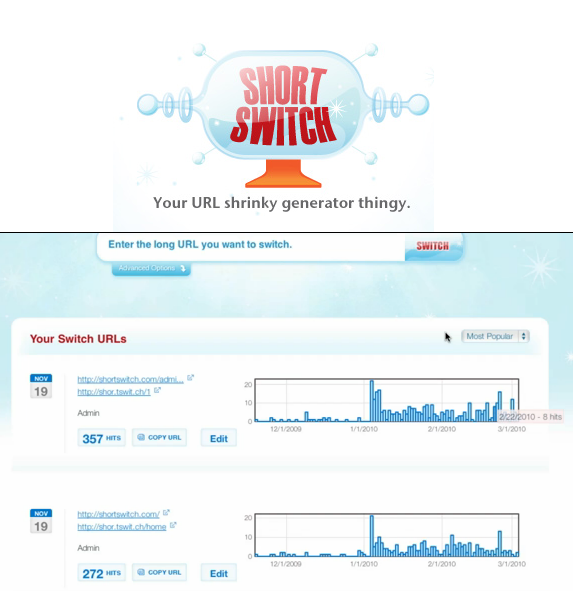 ShortSwitch is a slightly lower cost service than Awe.sm, but provides some of the same basic service – meaning link shortening with the custom short URL of your choice and an option to integrate with Google Analytics, as well as providing its own reporting on your most popular social updates. Setting up the DNS redirect should be a little more straight forward than Bitly’s, simply enter the URL details in the box provided and wait for the redirect to take effect. As each account is given its own namespace, all tags for links are freely available too. For example, you can have a URL that reads http://shor.tswit.ch/home where ‘home’ is the custom token. ShortSwitch also provides paying users with features like API support for integration into apps, customizable interstitial pages prior to the redirect, customizable toolbars for the destination page and support for multiple users of the same account. Pricing for the basic service costs $10 per month and is limited to 1,000 links per month, 10 users, 100,000 redirects, a custom homepage redirect and toolbar/interstitial support. Bump that up to the $50 per month premium package and you’ll get up to 100,000 links per month, 1,000,000 redirects and support for 50 users as well as the other tools. 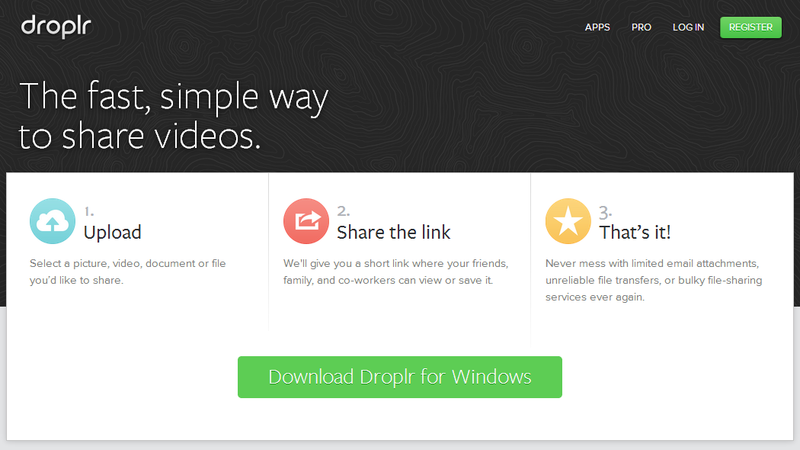 While Droplr is primarily a cloud sharing app for things like videos, pictures or any other type of file, it can also be used as a custom URL shortener too. It used to offer free shortening services for personal users and a paid-for tier for more professional users, it now offers only paid services, starting from $4.99 per month. However, if you want to get your hands on custom domains, themes and branding options, then you’ll need to be a paying user, which starts from $9.99 per month. All you’ll need to do once paying-up is point your domain at Droplr’s servers by changing the A-record to 50.112.122.158, then sit back and wait up to 72 hours for the changes to take effect. Once they have, just log into your Droplr control panel and change the Custom Domain setting to match your new domain. Upgrading from the free to paid-for Droplr account also provides you with some feedback in the form of a dashboard and statistics, although it might not be quite as fully-featured as the more expensive options here. If you’re like our very own social media maestro Matt Navarra, you’ll like managing all (or as many as possible) of your social-related tasks from one place. 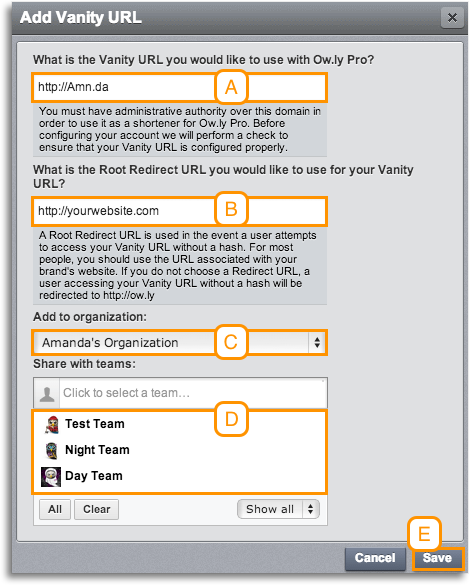 Handily then, if you’re a HootSuite user you can use Ow.ly to shorten your links to a custom domain name, simply by enabling the ‘Vanity URL’ option present in Pro (from $8.99 per month) and Enterprise (pricing on request) accounts and then creating an organization. After that you simply need to instruct your registrar to point the DNS A record to 204.15.172.215 and choose a few settings in the Hootsuite dashboard associated with your vanity URL. When the changes have all processed correctly, you should receive an email. You then can simply use HootSuite in conjunction with your custom URL et voila! If you want more of an emphasis on the marketing side of things as well as simple link shortening, BudURL is another contender to consider. As well as allowing you to create custom URLs for your site, it’ll also provide detailed information about the users engaging with your updates ranging from a general performance overview to a detailed link-by-link basis, should you so wish. There’s also a neat real-time interaction feature worth checking out. However, BudURL goes beyond mere statistics and offers up tools for full campaign management ranging from QR code support to custom links for mobile landing pages. BudURL has a range of plans from its Solo offering (which includes support for one custom URL among other features) at $24 per month up to its Agency plan priced at $249 per month. Those are just a few of the services available today, at a range of prices, to get you up and running with your own custom URL shortening service. However, if you’re more technically-minded and are happy to take on the challenge of hosting a service yourself, then you simply need to (as with all the examples above) secure your own domain name which is probably the hardest/most fun part of the process anyway. It’s worth bearing in mind though that domains for different countries cost different amounts, for example, if you wanted to register a domain in Puerto Rico (.pr) like wrap.pr for your business then it would cost you $1,400. Your next step (which you know already, being technically-minded) is to choose a hosting service – dedicated or shared is up to you, but if you plan on letting other people use it too, you’ll probably want a dedicated server but again, worth keeping in mind that this is the more expensive option. All you have to do after that is install your PHP URL shortening scripts via a service like YOURLS or PHURL – both of which are open-source and therefore free to set up. YOURLS is probably one of the most widely used shortening scripts for users looking to get custom vanity short domains on their own terms. 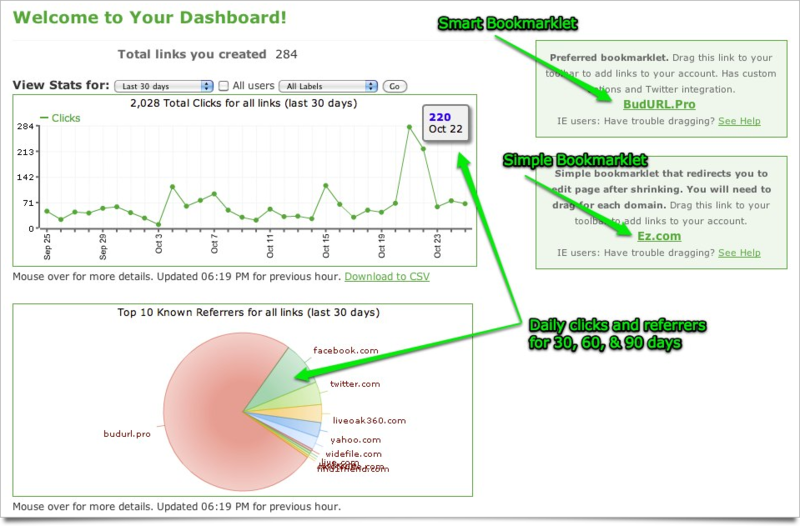 It also has the benefit of still providing some of the analytics and link-tracking goodness. If you’re on a budget that’s slightly bigger than ‘free’, you might want to check out the lower-end of the price scale on Code Canyon too. Alternatively, if you’re looking for a WordPress-only solution to your problem, plugins like Pretty Link Pro allow a whole host of custom link functionality for a one-off payment of $37 or $97, depending on your requirements. If we’ve missed your favorite off this list, let us know in the comments below and we’ll take a look at it. If it’s any good, we’ll add it in.